The following procedures illustrate how to create a drill-through link to another report containing details about the linked item. This walkthrough uses tables from the Reels database. By default, in ActiveReports, the Reels.mdb file is located in the [User Documents folder]\GrapeCity Samples\ActiveReports 13\Data folder. When you complete this walkthrough you get a layout that looks similar to the following at run time. In the Add New Item dialog that appears, select ActiveReports 13 Page Report and in the Name field, rename the file as MainReport.rdlx. Click the Add button to open a new page report in the designer. In the Report Data Source Dialog that appears, select the General page and in the Name field, enter a name like MainReportData. In the Report Explorer, right-click the data source node and select the Add Data Set option. In the DataSet Dialog that appears, select the General page and enter the name of the dataset as Movie. This name appears as a child node to the data source icon in the Report Explorer. Select the following table rows and go to the Properties window to set their properties. In the Add New Item dialog that appears, select ActiveReports 13 Page Report and in the Name field, rename the file as MovieDetails.rdlx. In the DataSet Dialog that appears, select the General page and enter the name of the dataset as MovieTitles. This name appears as a child node to the data source icon in the Report Explorer. In the Report Explorer, select the Parameters node. Right-click the node and select Add Parameter to open the Report - Parameters dialog. Set properties in the following fields below the parameters list. Click OK to close the dialog and add the parameter to the collection. This parameter appears under the Parameters node in the Report Explorer. 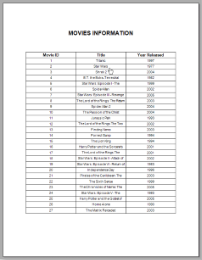 In the DataSet Dialog that appears, select the General page and enter the name of the dataset as MovieInfo. This name appears as a child node to the data source icon in the Report Explorer. On the Parameters page under Parameter Name enter MovieID. In an Page report, set the Dataset name in the FixedPage dialog > General tab to MovieInfo. For more information, see Fixed Page Dialog. Caution: In an Page report, you may get an error if the Dataset name for the FixedPage is not be specified explicitly. Click the gray area below the design surface to select the report. Go to the Properties window, expand the PageSize property and set the Width to 8.5in and Height to 3in. With the List control selected, at the bottom of the Properties Window, select the Property dialog command. In the List dialog that appears, on the Detail Grouping page, set the Group on: Expression to =Fields!MovieID.Value. 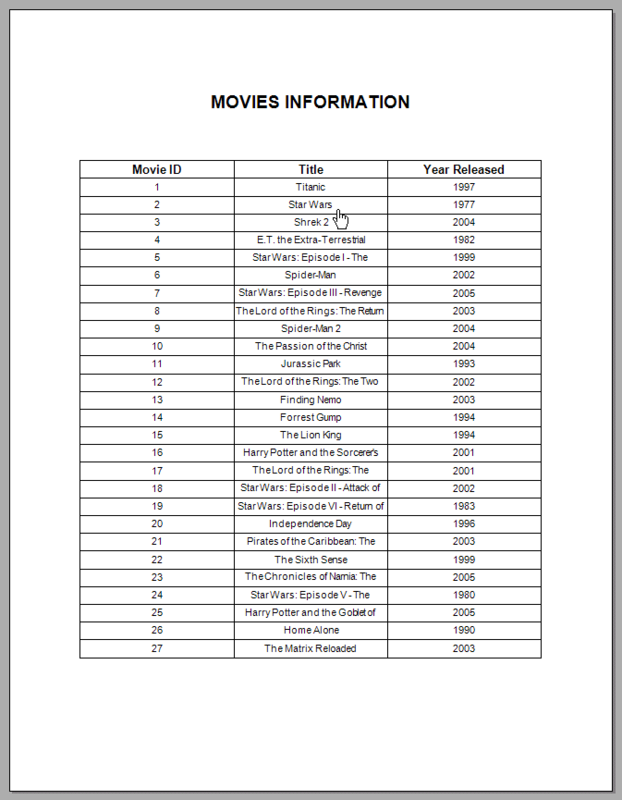 From the Report Explorer, go to the MovieInfo dataset and drag the following five fields onto the MovieList data region. In the properties window, set their properties as indicated. Value =Fields!Length.Value & " minutes"
Note: When you drag and drop fields from a dataset in the Report Explorer onto the design surface, these fields are automatically converted to Textbox controls that you can modify by setting the control properties in the Properties Window. From the Report Explorer, drag four TextBox controls onto the MovieList data region and in the properties window, set their properties as indicated. Switch to the Designer with the MainReport.rdlx. On the design surface, select the cell containing the Title field inside the table details row and at the bottom of the Properties Window, click the Property dialog command. In the Textbox dialog that appears, go to the Navigation page. Under Action, select Jump to report and set the report name MovieDetails.rdlx. Under Jump to report set the Name of the parameter to MovieID. Caution: The parameter name must exactly match the parameter in the target report. Set the Value to =Fields!MovieID.Value.